“I vant to be alone”: – like ‘play it again, Sam’; ‘Frankly my dear, I don’t give a damn’; “Go ahead -make my day” and ‘Nobody puts Baby in a corner’; another one of those movie quotes that have become iconic. ‘Alone’ was Greta Garbo’s most famous line from the 1932 GRAND HOTEL flick she made with Joan Crawford, Wallace Beery & two Barrymores. The Robert Wright & George Forrest musical version is the latest blockbuster by Theatre Sheridan. From the almost overwhelming opening number until final curtain, the musical version is a spell-binder. The 39 members of the cast are triple-threats – actors, singers and dancers but it is the creative direction and choreography that craft this presentation into another Arts Review TOP TEN contender. Like its contemporary – John Ford’s STAGECOACH; the plot deals with a heterogeneous and diverse group of stereotypes, except the milieu is the classiest hotel in post Great War Berlin. A financially strapped young aristocrat; a past-her-prime danseur; a disabled veteran doctor (who also is a somewhat M.C. ); a dying Jewish accountant; an American financier facing ruin and of course; the hotel staff and the lead characters’ sycophants. The interaction between personalities reflect the ballerina’s description of being ‘fire and Ice’! A December/May love affair; optimistic ambition; surprising empathies and especially the birth/death symbolisms are all part of the pastiche or collage that form the plots. Astonishingly, given the caliber of the entire cast, there are some standouts. The U.S. wheeler/dealer is Jonah McIntosh and his inner struggle with bottom line vs expediency is a highlight moment. Andrew MacNaughton is the impecunious Baron and even his posture epitomizes his charismatic aristocracy. MacNaughton manages to display personal fear as well as bravery and his surprising compassion to some of the other typecasts is thespian talent at its best. The terminally ill accountant, Greg Solomon not only looks the part, his every utterance and especially responses to others perfectly defines the character. The show-stealer is certainly Kate Madden whose Frieda; (nicknamed Flaemmchen) just explodes with personality. Facial expression, timing and a powerhouse smile are balanced by a dynamic rendering of her ingenuous response to a seduction. This iteration of GRAND HOTEL is remarkable for the meticulous and comprehensive direction by Brian Hill. The changing focuses and emphases are smooth yet almost radical in execution. Even those familiar with the story will experience not even a particle of precognition. His timing instructions vary from extended pauses to immediate responses, so that audiences are constantly alert to the ongoing on-stage events. To keep so many sup-plots fascinating and holding audience awareness is the mark of an artist. The chorus numbers are intricate and highly synchronized. In an off-the-record dialog with Robert Allan during intermission; learning that this man can keep so many individual’s relative positioning and cohesiveness in his mind, made this scribe mentally compare him with the challenges facing a top-level Air traffic controller! The muse co-related his ability to an architect who conjures up those 400-series clover-leaf interchanges; aka a spaghetti bowl but with names! The musical accompaniment by Michael Barber and four musicians are faultless and never overpowering, even though they perform on-stage at the rear. The costumes by David Juby are correctly outdated and reflect the personas of their wearers. The set design is unsophisticated so no distractions from the live theatrics. 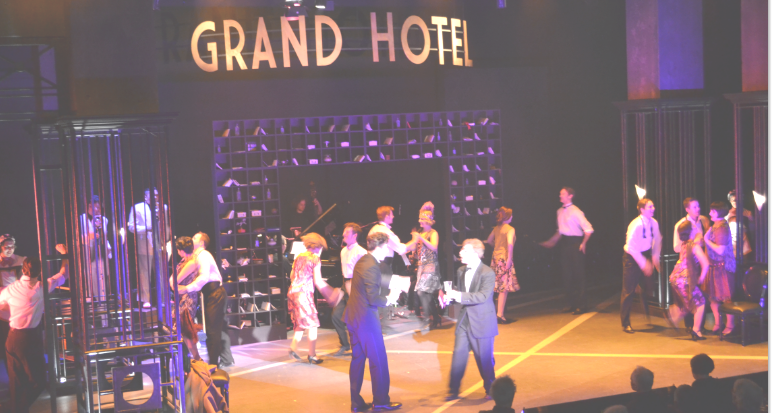 GRAND HOTEL, The Musical is at Theatre Sheridan on Trafalgar Road until Apr. 24th. VALENTINA LISITSA champions Russian music!